Read the Commentary for Chapter 24. Familiarize yourself with the map of the voyage of Jason and the Argonauts. View Delacroix’s painting of Medea. View various images of Medea. Read Apollodorus’ account of Jason and the Argonauts. Read Pindar, <=""> 4, in which the poet recounts some of the incidents in the story of Jason and Medea. Read Apollonius’ Argonautica, an epic version of the voyage of the Argo. Compare Ovid’s characterization in Heroides 12, a letter from Medea to Jason, with that of the ancient sources you have read thus far. Compare and contrast the modern rendering of the myth in Jean Anouilh’s play Medea with Euripides’ version. What is the meaning behind D. H. Lawrence’s poem “The Argonauts”? 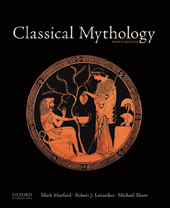 Pick an essay on the medium that interests you most in the array of transformations inspired by the Medea legend in the volume edited by James J. Clauss and Sara Iles Johnson, Medea: Essays on Medea in Myth, Literature, Philosophy, and Art. Read and explore. Watch Medea, the imaginative andpowerful film by Pier Paolo Pasolini. Write a review of the performance of the renowned Maria Callas. There are many operatic treatments of Medea. The one by Luigi Cherubini is among the very best. Listen to it carefully and compare Callas the soprano with Callas the movie actress. You may already be familiar with the popular movie, Jason and the Argonauts. Do you find the role of Medea weak? What do you think of the special effects? A Dream of Passion is a much more challenging movie than Jason and the Argonauts. How does the character of the modern day Medea (brilliantly portrayed by Ellen Burstyn) compare with the Medea of the legend? Robinson Jeffers’ adaptation of Euripides’ Medea appears in two performances on video, one starring Judith Anderson and another starring Zoe Caldwell. Evaluate the performance of either one or both. We hope you were fortunate enough to see Diana Rigg’s outstanding interpretation on the stage. In her ballet Cave of the Heart, Martha Graham again provides one of her profound psychological forays into the feminine psyche, which deserves study. The music is by Samuel Barber. Medea, a Russian ballet, is a more traditional treatment of the legend. View the constellations of Sagittarius and Aries. How does the legend of Jason exemplify the hero’s quest on Propp’s model? Compare and contrast two of the following heroes: Perseus, Heracles, and Jason. How is the figure of Medea depicted as a quasi-divinity, a sorceress, and romantic heroine? How do you judge Jason for his betrayal of Medea and Medea for the killing of their children? What are the elements of folktale in the legend of the Argonauts?